Talkatone for Android | Talkatone for PC | Talkatone iPad/iPhone | Free Pc to Phone Calls, Free Voip Calls to India International ! We have reviewed so many different mobile voip application on this blog. Be it Viber, tango video calls, Skype or any other we have reviewed so many of them. However the list of voip applications is so long and today we will be discussing about another similar mobile voip application for your iPhone, iPod Touch, iPad, Android devices. We are talking about voip app named "Talkatone". Talkatone allows you to make phone calls using Wifi or 3G. 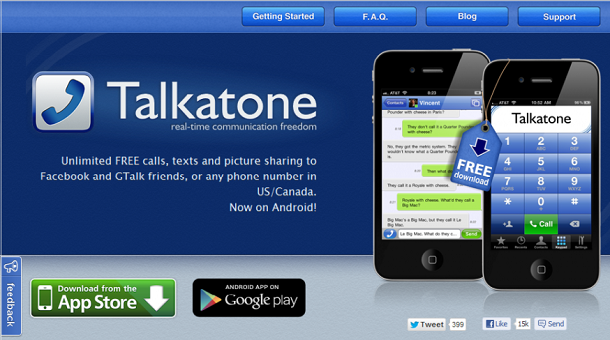 Basically Talkatone uses Google Voice as a channel to make free calls. Talkatone uses Google Talk and Google Voice services and bridges the gap between instant messaging on your computer and regular cellular calls on your mobile device. Talkatone helps you to make unlimited FREE calls, send text messages and share locations using data connection on your iPhone, iPod Touch and iPad. In order to get most out of Talkatone you need to have Google Voice Account and setup Google services. I believe Talkatone also allows you to login with your Gmail/facebook account. So with just a facebook/gmail account, you can make mobile calls for free. Talkatone for Android is currently under development and will be released soon. Talkatone makes its revenue with Ads. Talkatone is an ad-supported application. To set Talktone up log into your Gmail account and select the “Call Phone” option under Chat. Use the “Call Phone” option to make one call to a regular phone number. Then sign out from Google Chat and return to Talkatone. Update : Talkatone is now launched for Android as well. Check below. High quality audio with voice compression for calls. To cover the cost of development and providing the service Talkatone app displays banner ads. For calls initiated through main dialer and completed by Talkatone app, a pre-roll ad may be shown once in a while. This app has been released for Android Mobiles as well. It works for Android: 2.2 (2.3+ is required for BlueTooth and speakerphone), armv7 or x86 CPU. When you download and launch the Talkatone app the first time you'll be presented with two login options - Facebook and Google. If you want to text with Facebook friends or give them a call login with Facebook. Talkatone will pull your friends and sync them with a local address book. If you want to call and text your Google buddies you may login with Google. You may also make absolutely FREE phone calls and send texts in US and Canada. Talkatone is awesome! No need for a cell phone plan if you have this app! It works fine for a day but then I go to open it and I get a black screen. Have to uninstall and reinstall to get it to work again. Wtf! WTF is wrong with this developer? No matter which way I hold my Nexus 10, Talkatone is upside down. When I flip the nexus 10, Talkatone flips UPSIDE DOWN! WTF!!! You guys from Mars or what? Seems that lot of people are facing problems installing and using Talkatone app on their android mobiles. It is high time that they make a stable app. Still more than 2000 people have given them 5 star rating! Please note that talkatone does not offer any official app for your computer. However that said you can install an android emulator on your laptop/PC and use the android apk to use Talkatone on PC. It works in the similar way with which we got Whatsapp application working on your PC. Offcourse it would have been better Talkatone would have themselves launched a PC application and people would have used it seamlessly. Why not go ahead and start requesting in the comment section. I am sure Talkatone people will hear up and reply back. Talkatone is built on top of Google Voice and unfortunately Google Voice is only available in the US, Canada and Europe. Thus, residents of other countries only have partial access to Talkatone functionality. The ability to call anybody who also has installed Talkatone anywhere in the world. Invite your friends to download Talkatone. The ability to import your Google chat contacts and Facebook contacts and message them from a unified interface. Basically the full usage is limited to people having Google voice account. So if you do not have Google Voice account than what you cannot do is "make free calls to USA/Canada"